1. Being alone in the house all day with nobody to boss around....uh-NURTURE. I meant nurture. 2. Gives me some work experience, since I haven't worked for anyone that hasn't passed through my loins since before Sierra was born. Work experience for what, I don't know. I'm still lost when it comes to that whole "what I want to be when I grow up" thing. 3.Keeps me in check when it comes to projects around the house. At least, that's what I was hoping. So far it hasn't worked. But at least I won't be shopping all day, right? Most women love buying clothes, shoes and bags....no thanks. I'll take paint/trim/fabric/random tables off Craigslist that I don't need anyday of the week thankyouverymuch. With this new role comes a new identity. Or, more precisely, a lack of identity. Nobody knows anything about me. Nothing except that I have a habit of busting into song and dance without warning. And I'm sure that they are wishing that they didn't know that. But that's it. I'm not the mom with a bunch of kids, or the piano lady from church, or the neighbor that is constantly struggling with the weeds in the front yard....I'm just me. And guess what? For the first time it feels like I've been stripped of everything that defines me. Everything in my life that tells the story of who I am. Or who I thought I was. I didn't realize on how much I LET all these things define me. But I'm learning that all though these pieces play a big part, they certainly don't make a whole. P.S If you wanna stop in and say hi, Fridays are the best....live music day. A guy and his guitar that gives my "acoustic station" on Pandora a run for it's money. It is hard to imagine starting out with NO Identity.... Can't imagine...I love you just the way you are.... Just YOU! Passed through your loins? ROFL!! Glad you are enjoying it. We missed you at the movie yesterday. hmmm....I'm now starting to wonder who the heck I really am. I think I'm kind of afraid to find out. At least the piano lady and the weed lady are nice people. Remember our piano lady? Nice and her weren't even on the same planet! Is it a potbelly's? 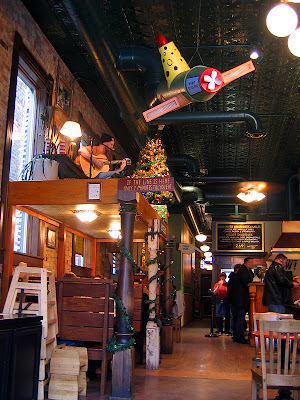 We moved from VA last year and I so miss potbelly's.